Since our inception in 2009 Insure4Sport® has quickly grown to become the UK’s largest provider of specialist sports insurance to coaches, clubs, teams and individuals – many of these for Angling. **2015 Inclusive Liability Insurance provided to Angling Trust member clubs through Insure4Sport. The cover detailed below is available to Angling Trust Clubs and covers the individual throughout the World. If your wage roll exceeds that of which is included with your Angling Trust liability insurance you can upgrade you employers liability to cover the difference. Please see the table below for a summary of additional costs. advice is given by or under the direct supervision of a fully qualified person. • ‘Member to Member’ and ‘Participant to Participant’ liability in respect of activities authorised and recognised by The Angling Trust. • Non sporting associated activities such as social or fundraising functions. • Prospective members ‘taster’ sessions (up to 3 sessions per individual). • Visitors not limited by number. • The use of watercraft in connection with Angling, not exceeding 8 metres in length. authorised and recognised by The Angling Trust. • Standard extension for Trustees. to an annual wageroll/benefit in kind amount of £25,000 (cover extensions beyond this limit are available). Insure4Sport is a trading name of Ripe Insurance Services Limited which is Authorised and Regulated by the Financial Conduct Authority No. 313411. Registered in England No. 04507332. Can I buy this insurance direct from Insure4Sport? No, this insurance is only available as part of the Angling Trust membership. Do we (our club) need to provide Insure4Sport with our details? No, we will work with the Angling Trust and the information they have. You will receive your insurance documents with your Angling Trust membership pack. The insurance document talks about ‘qualified’ people, what does that mean? Do we need a First Aider to be at the club at all times? No, whilst this is desirable we recognise it is impractical to expect a qualified person to be in attendance at all times when the club is operational. With regard to coaches insurance is there a limit to the number of coaches at any one club? Do we need to name our coaches? No but all coaches should be qualified or have a level of competence to coach and be authorised by the Angling Club to coach. Can the coach, coach elsewhere? No they are only insured at the club or at a venue hired or occupied by the club. Does the insurance cover ground maintenance and bailiffs? Yes as long as they are qualified to carry out those duties or have been appointed by the Angling Club. 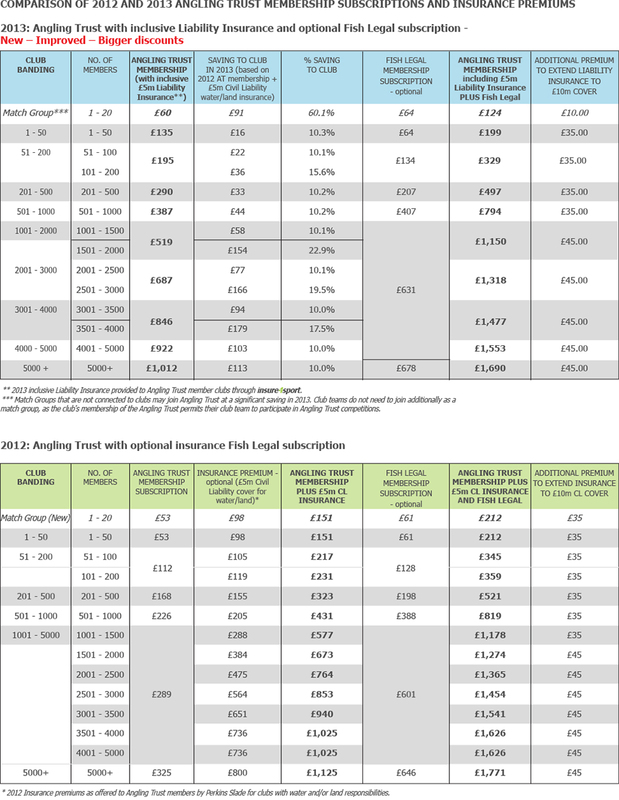 What is the Excess on the Angling Trust insurance scheme? There is no excess on Employers Liability or Sports Liability. A £250 excess applies to Directors and Officer’s cover only. I would like to include Personal Accident Cover and also some Contents, how can I add this? This cover will be available for 1st February 2013 via Insure4Sport, details can be viewed on this website or you can call 08000 92 4646. Does this cover night fishing? Yes night fishing is included. What are the limits of your boats? We can cover your clubs liability whilst using boats providing they do not exceed 8 meters in length. Can I opt out of the insurance? The insurance is a mandatory part of the Angling Trust membership. Where can I get a duplicate copy of my insurance details? You can download from this website or you can call Insure4Sport and we will send you new copies. It is protection against your legal liability for bodily Injury to third parties and damage to their property including nuisance, trespass, wrongful arrest or interference. Does it matter if we own or lease our waters? Protection against your legal liability arising from negligent acts, errors or omissions committed in connection with angling. How is our membership and insurance premium calculated? Your insurance premium forms part of your membership fee and is based on the number of club members you have. What is the difference between a 'Claims Made' and 'Claims Occurring' policy? A ‘Claims Made’ policy is designed to cover claims reported during the annual insurance period. Cover will remain effective so long as insurance is continually uninterrupted with the same insurer. A ‘Claims Occurring’ policy is designed to cover claims that occur during the annual insurance period. Cover will remain effective but is NOT dependent on the renewal of the insurance. Will we need to have a club constitution? No, this is not a requirement for Insure4Sport. Do we need to appoint a new Health & Safety Officer? Can we upgrade the cover to £10 million Limit of Indemnity? Yes, this can be done when you renew your Angling Trust membership. Yes, they are covered under a standard extension with the directors and officers’ liability insurance. Is there a restriction on the number of visitors who attend the club? Are we covered for shooting as part of pest control? Yes, providing the shooting is for occasional pest control. Am I covered for welding? The standard policy does exclude welding however we do cover it on a referral basis. In order to check if you can be covered for welding please call us with details of what work would normally be carried out and who would be undertaking the activities. Please contact the Customer Service Team on 0800 112 4084. Personal accident – Provides personal accident cover for either the whole club or work parties, bailiffs and committee members only. Buildings and Contents – Provides cover for a range of buildings and contents including steel containers, gardening and maintenance equipment, rowing boats and trophies. Extended Employers liability – For clubs which have a wage roll exceeding £25,000 per annum. Fishing Care – Equipment cover, personal accident, third party property damage, hospitalisation, match and club fee reimbursement for individuals. Discounts available for Angling Trust members. For any other insurance needs please contact our customer service team on 0800 092 4646. Angling Trust Level 1 & 2 Coaches automatically receive £5m Public Liability and Professional Indemnity insurance as part of the Angling Trust Scheme. Details of this cover can be found below. We can also provide you with other insurance requirements such as Personal Accident or your Angling Equipment. Please click on the links at the top of the page or call our dedicated Angling Trust line on 0800 092 4646. All coaches who are licensed with the Angling Trust will automatically receive public liability and professional indemnity insurance as part of their Angling Trust coaching licence. Public Liability Insurance is protection against your legal liability for bodily injury to third parties and damage to their property including nuisance, trespass, wrongful arrest or interference in connection with your role as a coach, guide or gillie. Professional Indemnity Insurance is protection against your legal liability arising from negligent acts, errors or omissions committed in connection with your role as a coach, guide or gillie. If you are not an Angling Trust Coach and require insurance this can be purchased here with prices starting from just £47.49. Can I upgrade the cover to £10,000,000 Public Liability? Yes, but you will need to contact the Angling Trust Coaching Licensing Team on 01568 620 447. Sports Equipment Cover – Provides protection against loss, theft or damage to your valuable sporting equipment. Single article limit of £250 applies. Since our inception in 2009 Insure4Sport has quickly grown to become the UK’s largest provider of specialist sports insurance to coaches, clubs, teams and individuals – many of these for Angling. We pride ourselves on our high level of customer service and your club's transition to Insure4Sport would therefore be seamless. The only difference you will notice are the savings you will make on your premium. Protection against your legal liability for bodily injury to third parties and damage to their property including nuisance, trespass, wrongful arrest or interference. Standard indemnity limit is £5,000,000 any one occurrence. This can be increased on request and an additional premium will be payable. This section of the policy is a ‘claims occurring’ wording. Standard indemnity limit is £5,000,000 any one occurrence and in the aggregate. This can be increased on request and an additional premium will be payable. This section of the policy is a ‘claims made’ wording. Protection against your legal liabilities for injury to your employees up to a limit of indemnity of £10,000,000 including costs and expenses. What is the Excess on the insurance scheme? There is no excess on Employers Liability or Sports Liability. Please contact Insure4Sport on 0800 092 4646 and we will send you a new copy. Is the Insure4Sport policy a ‘Claims Made’ or ‘Claims Occurring’ policy? It is a 'Claims Occurring' policy. Is there a restriction on the number of employees I have? No, there is not limit on the number of employees or your annual wage roll. Extended Employers liability – For clubs which have a wage roll exceeding £10,000 per annum. Directors & Officers liability Cover – Provides liability cover for directors and officers arising from negligent acts, errors or omissions committed in connection with angling including all activities authorised and recognised by The Angling Trust. Please mention to our customer service team that you need this extension. Personal Accident - Provides employees and directors and officers compensation following an accident whilst coaching. Benefits can include accidental death or disablement, physiotherapy cover and broken bones. To add any of these options on please mention them to our customer service team when taking out the policy. You can contact the team on 0800 092 4646. As an individual Angling Trust member you automatically receive £5m limit of indemnity cover for Sports Liability (also known as Civil Liability). The summary of cover is provided below. If you require additional cover for your Angling Equipment, Personal Accident, Third Party Property Damage, Hospitalisation, Match & Club Fee Reimbursement please visit www.insure4sport.co.uk/fishingcare Angling Trust members receive exclusive year on year discounts. (b) Damage to property belonging to others, but not any property that is owned by or in the custody or control of you or your family; arising from an accident occurring during the Operative Time. (b) In the event of a claim under this Section, you shall immediately send us any notification, writ, summons or legal process and provide us with all the necessary information and assistance to enable us to negotiate the claim or to institute proceedings. You must notify us immediately of all circumstances that may give rise to a claim under this section and continue to advise us of the situation until the claim has been resolved. Fishing Care is a brand owned by Insure4Sport and is aimed at individual anglers. Federation who’s member clubs are all members of the Angling Trust automatically receive insurance as detailed below. If any of the clubs within the Federation are not members of the Angling Trust the Federation will need to purchase its own insurance policy. If you would like a quote for Federation insurance please contact Insure4Sport’s Angling Trust dedicated line on 0800 092 46 46. We are also able to help you with your Personal Accident, Building & Contents cover and any additional Employers Liability cover your require. including nuisance, trespass, wrongful arrest or interference. recognised by The Angling Trust. trained or experienced in the use of such equipment. connection with Angling, including all activities authorised and recognised by The Angling Trust. £25,000 (cover extensions beyond this limit are available). Protection against your legal liability arising from negligent acts, errors or omissions committed in connection with angling including all activities authorised and recognised by The Angling Trust. No, cover can only be provided through membership with the Angling Trust. All clubs within the federation must also be Angling Trust members for the federation to be covered. Qualified shall mean that person has appropriate qualifications or registration or accreditation or authorisation from the Insured body (The Angling Club). We will not cover you legal liability following use of a boat which exceeds 8 meters in length. 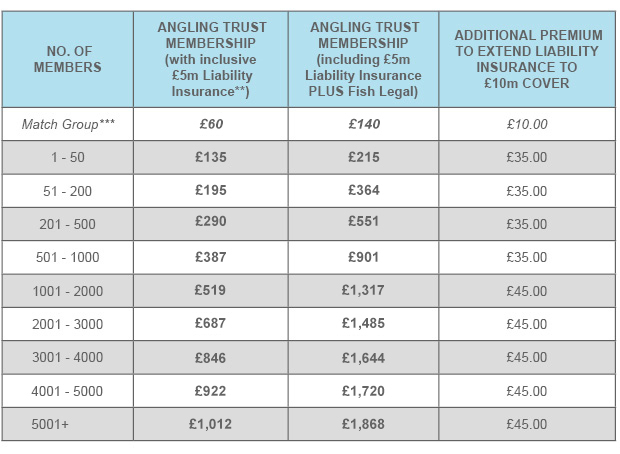 Angling Trust Member Insurance Schedule - £5 million Angling Trust Member Insurance Schedule - £10 million Combined Liability Insurance - includes Sports Liability, Directors & Officers and Employers Liability Insurance. The cover listed below is available to Angling Trust Clubs, Fisheries, Riparian Owners, Coaches, Individuals and Federations. *Steel or brick/block construction only **Excludes damage to Sporting Equipment whilst in use. To purchase one of the policies above please call our dedicated Angling Trust line on 0800 092 46 46. Is there a specific type of lock required for the containers or outbuildings? There are minimum security conditions applicable, please read the policy wording before purchasing a policy to make sure you can adhere to the restrictions. Are my contents insured away from the building? This depends on the type of policy you have selected please let the customer service team know you require this extension to see if this is possible. Details on where the contents will be kept when away from the insured premises may be required. Do you provide cover for Trophies? Yes, these can be covered depending on your requirements and where they will be kept overnight. Can I reduce the excess on the policy for an increase in premium? This may be a possibility depending on your claim history, please contact our customer service team to get a quotation. Please call 0800 092 4646. For any wage roles that exceed £200,000 please contact our customer service team on 0800 092 4646. Insure4Sport is a trading name of Ripe Insurance Services Limited which is Authorised and Regulated by the Financial Services Conduct No. 313411. Registered in England No. 04507332. What if my wage roll increases within the year? If your annual wage roll increases above the bracket you are already in, please contact us as an additional premium may apply. Are volunteers covered under employers liability? If the court deems the volunteer to be an employee they will be covered under this section proving that the benefit in kind is less than the equivalent annual wage roll declared. The cover detailed below is available to Angling Trust Clubs & Coaches and covers the individual throughout the World. This benefit covers only amounts which are not covered by the public health system of where the insured person is domiciled. Further it only applies to the difference between any private health insurance rebate and the actual cost incurred by the insured person. • Lump sum net loss of income benefit. Entitlement to this benefit does not commence until after the expiry date of the excess period. Amounts are payable up to the maximum claim period noted in the policy schedule. • Injury assistance and parents inconvenience benefit. Only applicable if payment is not made under the lump sum net loss of income benefit. We will reimburse the insured person with the percentage specified in the policy schedule of non medical expenses directly relating to the bodily injury. Amounts are payable up to the maximum claim period noted in the policy schedule. • Suicide or attempted suicide, intentional self-injury or deliberate exposure to unusual danger (except in an attempt to save life) or your or the insured person's own criminal act, or an insured person being under the influence of alcohol or drugs, or suffering from mental sickness, nervous anxiety, depression, emotional disorders or stress related conditions or complaints (even if the mental sickness, nervous anxiety, depression or stress related conditions or complaints arose out of a physical accident or bodily injury). • The insured person engaging in or taking part in any sport/s other than the sport/s nominated in the policy schedule. • Driving or riding in any kind of race, or the insured person taking part in hazardous sports, persuits or pastimes not declared to us, or engaging in naval, military or air force services or operations. Is there an age restriction on the policy? No however payments are less for those under 18 years of age please see the policy wording for full details. Do I have to cover all the members in the club? No there is an option to cover the committee, maintenance teams and bailiffs only. Do we need to contact you if our numbers increase? If you numbers have increased please contact our customer service team as there may be an additional premium to ensure all club members are covered.